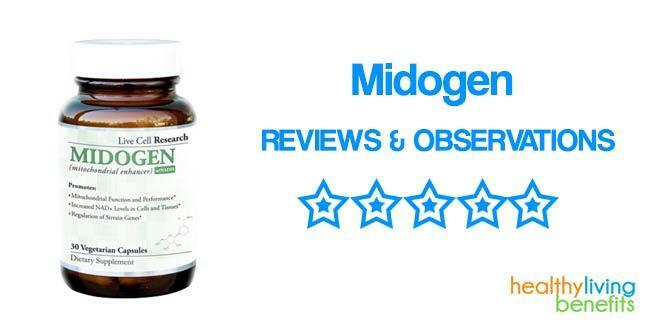 With just a glance at its label, it is clear that Midogen, a supplement which aims to improve energy and longevity through actions at the mitochondrial level of cells, demands a closer look not just from the potential buyer or from the average reviewer, but from anyone who is interested in the applications of geriatrics. There is a host of dietary supplements out there which claim to improve energy levels (and general well-being) through a more harmonious digestion or by supplying the body with a miraculous cocktail of vitamins and minerals, however, there are few products that target the cellular level and target the improvement of the very building blocks of life. In this review, we will assess the plausibility of Midogen’s purported benefits by taking a closer look at its ingredients and the existing research on the intricacies of mitochondrial activity, while also bearing in mind the reputation of Live Cell Research (the California-based manufacturer of Midogen) and the current body of reviews and testimonials. Live Cell Research is a manufacturer of dietary supplements which takes the organic metaphor awfully serious. Their primary belief is that for an organism to achieve a state of overall health, the cellular level should be targeted first. As every serious company should, Live Cell Research has declared five essential principles which guide the manufacturing of their products and interaction with clients. These policies range from exceptional quality of ingredients used for their supplements, to having a battery of tests performed by third parties, to a genuine care and concern for their customers. Naturally, the company does not bother with offering further details on what these third-party tests might entail (such as the names and qualifications). Furthermore, their interest for the customer is nothing more than a 90-day money back guarantee and customer center available 12 hours a day, Monday through Friday, and 10 hours a day on the weekends. The heartstrings of the consumer are further stimulated by Live Cell Research’s insistence upon American quality delivered through American ingredients, emphasizing that all their products are made in the USA and are proud to be in accordance with good manufacturing practices standards. Before we move on to presenting the official data about Midogen, we should mention that Live Cell Research produces 8 other nutritional supplements and that Midogen is not their flagship product. As is evident from the arrangement of their website, Niagen is their principal product, a supplement whose workings are related to those of Midogen, claiming to boost biological communications in the cell between the nucleus and the mitochondria through the delivery of a compound called NAD+, which stops or even reverses the aging process, at least at the cellular level. Vital Stem is another product which encourages the production of adult stem cells in the bone marrow, a process which aims to counteract specific age-related ailments in the bones and muscles. Cerastim is a nootropic supplement that boasts of containing only the most potent strains of bacteria, in order to improve mood, focus, and memory. Pro Krill 1000 supplies a healthy dosage of omega-3 fatty acids in a recipe which also has its fair share of antioxidants and is far more innocuous than your ideal fish oil supplement, with its target being the improvement of heart and brain activity. Advanced Adult Probiotic is a supplement that promises optimum digestive health through the intake of 15 different strains of probiotics having a CFU-count of 30 billion. Advanced Joint Repair is an entirely natural concoction (containing black pepper extract, Boswellia extract, white willow, turmeric extract and eggshell membrane) promising significant relief of age-induced joint pain through curative actions upon the damaged tissue. Nervestim is a supplement which builds on the renown of Lion’s Mane (a species of Chinese mushroom with remarkable properties) and purports to help individuals with symptoms of neuropathy through the regeneration of the damaged nerves. LA-3 is just as full of promise because it stimulates the appearance of an enzyme called AMPK, responsible for converting the stored body fat into energy, a process which naturally could lead to countless benefits. This summary of the products manufactured and marketed by Live Cell Research shows that the company mainly addresses the elderly, or at least patients with age-related issues, promising to alleviate said ailments through the implementation of cutting-edge research of cell biology into their dietary supplements. Let us become acquainted with the science behind Midogen. 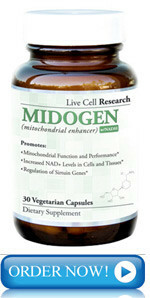 What first strikes the potential consumer when exploring the section dedicated to Midogen on the Live Cell Research website is that the label of the product is posted, a single aspect which should not carry much significance, however, it is more than many other manufacturers bother with their products online. As anticipated, the gist of the Midogen pitch is the scientifical novelty approach coupled with an instance of the organic metaphor. Cells are supposed to be organisms in miniature, with a decrease in energy at the cellular level impacting the whole body. Though that approach is a bit far-fetched, it is not without its degree of plausibility. The ingredients in Midogen come to the rescue by stimulating the mitochondria in cells, the parts of the cells which assimilate nutrients and thus produce energy to keep the cell functioning. The production of more energy does not merely assure an optimum operation of the cell but also aids the healing process and prolongs its life. links to studies supposedly confirming the potential benefits that the ingredients in Midogen deliver. Mitochondria are unusual structures that most cells possess. They are organelles, which means they are structures that have explicit functions within the cell, yet they are also relatively autonomous. In the case of mitochondria, they have their own genetic sequences and their division (proliferation) process is independent of the global division process of the cell they inhabit. The cause for this anomaly is probably a by-pass in the evolutionary process, where the separate single cell organisms which exhibited a penchant for energy production have been incorporated into larger organisms in a mutually beneficial symbiosis. Energy produced by mitochondria is the result of a chemical process involving the oxidation of pyruvic acid, glucose and a co enzyme called NAD (nicotinamide adenine dinucleotide) in a complex sequence of events involving the inner core of the mitochondria, eventually resulting in ATP (adenosine triphosphate). ATP is then transported through the whole cell because it is the form of energy that can be processed by all cells in the body. The importance of proper mitochondrial function is evident and has been emphasized by scientists since the 1950’s. A large number of studies have been undertaken and results show that alterations in the workings of mitochondria are responsible, at least in part, for a large number of disorders, such as neurological conditions (especially autism, schizophrenia, and bipolar disorder), several types of myopathy, endocrinological diseases including diabetes. Links between disorders and mitochondrial dysfunction are particularly difficult to point out with high degrees of reliability because of mitochondria’s own genetic material. The possible benefits of Midogen are predicated on three separate studies involving the actions of its ingredients. 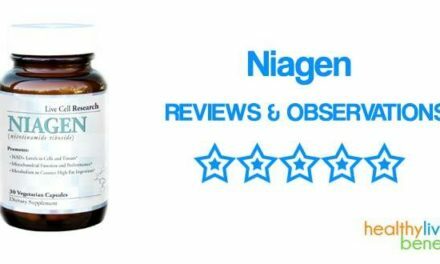 Firstly, one capsule of Midogen contains 10 mg of NADH – nicotinamide adenine dinucleotide, plus hydrogen. As we have mentioned in the previous section, nicotinamide adenine dinucleotide is an essential part in the synthesis of ATP at the mitochondrial level. A supplement of NADH may be useful for a significant number of various conditions – chronic fatigue syndrome (by boosting energy production at the cellular level), high blood pressure, depression, lowering the levels of cholesterol (through a better assimilation of sterols) or Parkinson’s disease. A number of studies concerned with the effects of NADH in patients suffering from age-related mental decline have proved ineffective. The chief problem with NADH supplementation is dosage – the standard 10 mg per day has shown itself to be safe across a variety of ages and conditions, yet ineffective in the treatment of most conditions, only proving mildly beneficial in increasing athletic performance in the short term. Between these aspects and pronounced anti-aging effects, there is still a long road ahead. The second essential ingredient in Midogen is Japanese knotweed (or fallopia japonica), a herb that is indigenous to East Asia, which contains trans-Resveratrol. Each capsule of Midogen has 300 mg of Japanese knotweed, providing 150 mg of trans-Resveratrol. The information on the website notes that the compound has a strong anti-oxidative effect, preventing damage at the cellular level that is inherent to the energy-releasing oxidating process. Other sources from which Resveratrol is usually harvested for supplements are red grapes and berries, a fruit whose antioxidant properties are common knowledge. The current stance on the benefits of resveratrol stresses its potential in reducing the rate at which certain malignant tumors spread and positive effects on the level of cholesterol. Other dietary supplements containing resveratrol propose a dosage between 250 mg and 500 mg. The study cited by Live Cell Research in order to back up their claims concerning the antioxidant properties of resveratrol proves that the flavonoid does neutralize the oxidative damage resulting from oxidation mediated by peroxynitrite and/or ferryl myoglobin. Nevertheless, the underlying purpose of the study was to confirm the hypothesis of cardiovascular benefits brought on by a moderate consumption of red wine. The last active ingredient in Midogen is pyrroloquinoline quinone, PQQ for short. The actions of this compound are supposed to inhibit the aging process through the creation of new mitochondria in cells while also increasing the performance of existing mitochondria. This all sounds a bit over the top and, at further inspection, PQQ supplementation does have some promising results in vitro and in some animal testing, however, definitive results in humans have shown only antioxidative effects. A study performed at University of California, Davis, on the actions of PQQ is cited on the Live Cell Research Website in order to support their claims distinctly states that promising results exist in rats concerning mitochondrial biogenesis, yet extrapolating these results would constitute a mistake from a scientific point of view. As is the case with every dietary supplement, always make sure to check with your doctor before embarking on a long-term consumption and, because they are not medicine and therefore not expected to treat any particular disease, do not expect wonders! With these common sense warnings in place, it should be noted that Midogen does not appear to be a scam. Of course, there will always be a little exaggerating in the product description and rather aggressive calls to action. But that is expected of any sales campaign. The main arguments in favor of Midogen are the absence of recurring inadvertencies or outright contradictions in the description of the ingredients and their actions. Furthermore, the citing of serious scientifical studies (although the relation between the studies and Midogen is a bit far-fetched) is a major plus. So is the fact that Live Cell Research publishes the product label directly on the website. On the other hand, there are a few websites which claim to be independent, third-party reviewers, yet they eulogize the product more than the manufacturer. Again, this is not wholly unexpected or even a downside necessarily. There are more nagging aspects such as statements regarding the “purest ingredients” or the ever-present “third-party tested” that are not elaborated upon. Keeping all these in mind, Midogen probably will not prove to be a fountain of youth via mitochondrial regeneration, yet it seems to be a supplement designed with the needs of the consumer in mind and there are certainly much less exciting products on which to spend $50 for a month’s supply. I have been taking Midogen & Active Stem cell for a month now. Exercise 60 minutes a day and I am in great shape for being 61. I have called the company twice to ask questions & their reply is take it for awhile longer. appears. They don’t mention prices just the guarantee. Before I knew what was going on I was conned into buying the three month supply. Since it takes more than a month before you feel it working. Then a salesman calls me back to tell me about Midogen. How it piggy back the Active Stem Cell. Now that’s another 3 month supply. When I called to speak to one of the agents. I asked her so what can I expect to happen. Her reply was I don’t know we sell other products here. I asked her well am I going to see a difference in my skin. Her reply was I don’t know. Then finally I asked her when is it going to start working so I won’t have anymore pain. She then said well did you see your Doctor. I said yes. She asked me did he give you anything for pain I said yes. But I told her the whole idea was this was suppose to stop muscle soreness not increase it. This was a expensive lesson that month everything bounced. I called right back to cancel and they said it was too late to cancel. I called back within 2 minutes and it didn’t arrive for several weeks. I decided to return everything. I advise to deal with this below zero company at your own risk. I felt no difference whatsoever. A very expensive scam preying on fears. I’m 6 weeks in and have noticed NO improvement. I got the same advice from customer service, to stay on the APK for the entire 3 months which I may do but I’m not expecting much. You are supposed to take the APK 30 min before eating with a glass of water which I do but I find that it feels like it bulks up my stomach like taking a bunch of fiber that makes you feel full. The measurement around my waist has increased, not decreased! I love this product, introduced it to my Chiropractor and he loves it too. Not a scam.